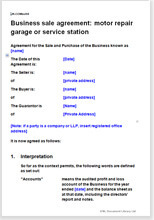 This is a comprehensive agreement for the sale of a business by an individual, a company or any other organisation. Note: not suitable for purchase of shares in a company. For a company purchase, See our Company sale agreements section.